At least that’s the way the forecasters would put it. It’s been a nearly snow-less winter so far. A fast moving snow storm came through yesterday and last night and left a little more than a dusting of the white stuff. 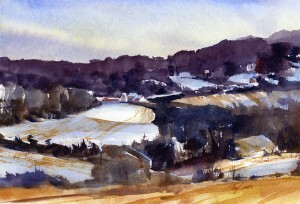 Not great for skiers, but really good for the landscape painter looking for rhythm and patterns in the winter fields. Deep snow covers everything. Lighter snow covers some fields completely, some others partially, while some look as if they are untouched by snow. This variety is tailor made for depicting movement and variety in a painting. There are also stark value contrasts where snow-covered fields meet the edge of woods and forests. Seeing the landscape in this condition makes it much easier to see the abstract patterns which can form the compositional structure of a painting. Then there are the overlapping and intersecting visual pathways formed by the “stepping stones” of similar fields, drawing us into the picture.